How did the transition from baseball to cricket happen? I had been living in Australia for about 20 years before I got involved in cricket.I was in baseball.I even worked as the head coach of the Australian Olympics team.I had my share of success and failures. Sometime in 2002, I met John Buchanan, the former coach of the Australian cricket team because we both lived in Brisbane and being in sports together, we would come across each other. One time John and I just had a conversation and he asked if I thought anything from baseball could transfer to cricket and vice versa. I said I wasn’t sure. I hadn’t done cricket, but for 20 years I’ve watched cricket now. One of the things that interested him was that I was not having a traditional background in cricket and he would ask me how you do this and based on my answer he would say I have never thought of doing it this way. The advantage I had was that I was able to look at things in a different perspective. Whenever things are put to him in a different perspective he would say “Mike, That is amazing, I’ve never heard it explained like that”. After that when he became the head coach for Australia, he requested me to address the Australian cricket team. I was a little reluctant, but he wanted to talk to them just the way I talked and explained things to him. Steve Waugh was the captain at that time and he said it was very interesting and said he was impressed to hear a different take on things from a different perspective. Steve invited me to go on some tours with the Australian team. I went on a few tours and a domestic tour as well; all this time I was doing baseball to. When Ricky Ponting became the captain in 2003, he invited me to go to the World Cup as their fielding coach. At that point I had to make a choice and went the cricket way. Within a span of six months after I met John Buchanan at a field in the Sunshine Coast, I was in South Africa for the 2003 World Cup. Then I’ve never looked back. I’ve been with cricket ever since. Did you bring specific techniques that were used in baseball into cricket? It’s a very hard question. It’s hard for me to sit here and say it was this or it was that. I think with me, it was more of a presentation and style. I’m more of an American style coach. I was a little flamboyant. It’s just a style that American coaches use. I think because I was different, players sometimes need a little bit of difference. Yes, there were definitely techniques that I brought in that hadn’t been used before, but nothing like blow away stuff. However I’m proud to say I was the first fielding coach in cricket, ever. Now every team in the world has a fielding coach. 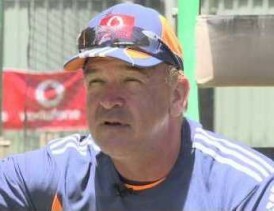 I believe the success we had early on opened the window that having a fielding coach does make a difference. There was no question that I had very good players, but having a coach did make a difference. I was the first fielding coach in cricket and I truly believe that brought some scope of interest, maybe fielding does need a specific coach. Now everybody does and I was the first one. I’m really proud of the fact that I made other teams sit up and notice that a fielding coach can make a difference and I’m happy to have been a pioneer of sorts. What exactly does a fielding coach or for that matter any coach bring to the table? I’ve been coaching for 30 plus years and if there’s one thing that I could tell you, the biggest mistake that coaches make is that they pigeon hole techniques. I cannot work with Andrew Symonds the way I work with Ricky Ponting. I cannot work with Michael Clarke the way I work with David Warner. They are all different. They run different. They throw different. They think different. Coaching is just not about catching and throwing. Coaching is about inspiring guys to get the best out of the talent they have in their body. You can’t give talent. My job is simple; to make it exciting for them to use that talent, to inspire them and say “Do you have any idea how good you are? I’ll prove it to you”. Once they play, they’re on their own. My job is not to coach, this is the way you do it, and this isn’t. That stuff is way overplayed. My job is to inspire players to use their talent to the best of their ability. It’s that simple. This may sound arrogant, but the reality is I can look at a player, whether it’s cricket or baseball, I can look, see him do some things on the field; see him go through some drills. I can say these are the things he does well. These are the things that he needs to work with. Here’s how you fix it. I can do that in one day. However if the player doesn’t have the intestinal fortitude and the drive, you will not get him to do that. My job is to look and say he’s not so good at this, but he’s real good at this. My job is not to see the things that he’s not so good at, make him great at that. My job is to make sure that the things he does really well, he does them every time really well. Be proactive, be positive about what the players do well and motivate them. All this, he needs to do this, he needs to fix this, that’s negative coaching. You don’t get the best out of players. Look at what they do well and work on that. Yes, and try to limit the things they do worse, because you’re not going to make them that much better once they get to the professional level. But what you cannot allow is the talent they have to be diminished. Whatever they’ve got, the positive things they have to get to the professional level, you have to maintain them rather than now he does that real well, so now if we can get him to do this. While you’re working on getting him to do this the other stuff diminishes. That’s the stuff that actually got him to the Big League level. That is variance coaching. It’s that simple. Most coaches, want to fix these guys. He doesn’t do this well. If I can get it, it will make me look good. That is not my approach. I am not in it for that. What is the key to being a good fielder? To be a good fielder, you want to have some physical skills. Obviously it’s better if you have a good arm and you have good speed. That’s obvious. Those kinds of guys are going to stand out. A guy that runs real fast, he’s real quick, and he’s got a real good arm, and he’s got real good hands, of course he’s going to stand out from a guy that doesn’t have those tools. The key to being a good fielder and the guys that don’t have all those great tools, is anticipation. One should also know what’s going to happen, understand the batsman, what shots he plays, how he plays, what would you do? I believe when you field, you think as a batsman in this situation what I would be trying to do to help my team as a batsman, then that helps a lot. At a professional level, I’m not saying they all think that way, but you’re going to be eight out of ten on the upside because everybody knows how to play the game. That’s what they should be trying to do. There’s your anticipation. The situation calls for this so I’m going to be anticipating that he’s going to do this. What is your opinion on the concept of match fitness? Is it over-rated? I think at times it can be over-rated. I think sometimes we spend way too much time getting in shape than we do playing the game, but it just depends. Of course you’ve got to be fit. But we’re not running an Olympic marathon here. Should we spend more time getting fit or more time batting? We have to look at the situation and say now we’re going to the Subcontinent. It’s going to be hotter. We’ve got to get in better shape. We’ve got to be fit. We’ve got to be ready for the heat. The situation is different. Do you think cricketers from Australia and South Africa seem to be comparatively better fielders than somebody from the Subcontinent? Is there a reason for that? I won’t totally agree with that statement. The perception is that we look at two or three players in a particular team and they’re really good, so we say the whole team is really good. I can tell you right now that I have worked with India and I have worked with most of those teams you mentioned. The Indian team is exceptional compared to where they were. I have a great deal of respect for them athletically. Most of these guys are professionals. Nobody’s bad, when you get to that level; you’re not a bad player. You’re a good player. It might be that somebody is a little better, but you’re still pretty damn good or you wouldn’t be playing and making a million dollars a year if you didn’t know how to play. I don’t judge others and say Australia is better than this. No, because I don’t agree. For instance players like Virat Kohli, Suresh Raina, Eoin Morgan they are all pretty damn good compared to any Australian or South African. Who do you think would have made good baseball players from cricket? I’ve been asked that many times. This is hypothetical, totally hypothetical. On tools, on talent, on things you look at, who would make a great baseball player from a cricketer? Andrew Symonds is an exceptional talent. He’s big, strong, fast, great arm. His arm was as good as anybody in the Major Leagues in America. I thought about Matthew Hayden for various reasons. Ricky Ponting would have been a premier second baseman. I’m talking about Australian guys because I worked with them a lot. Then all of a sudden, I saw Kohli play and he’s incredible. I see the guy throw. I see him run. I think to myself, this guy is a good athlete. Chris Gayle would have been an ideal DH(Designated Hitter). Michael Clarke, although he’s not a big person he is a very finesse savvy guy. I see him as a center fielder. These are good athletes. They just happen to play cricket. If they would have played baseball, they would have been great baseball players. Would they have played in the Major Leagues? I don’t know. If they would have stayed healthy. Yeah, they had the talent, but there are so many factors. There are a lot of guys. Dwayne Bravo and Dwayne Smith when I saw them as a kids, I actually called some Major League teams and said , I think you guys should look at Bravo and Smith. Who’s the best fielder you have seen in cricket? It’s a bit unfair to name one. I’ve been with Australia most of the time, so for Australians it’s three. The best fielders from Australia, there are three and that’s Symonds, Ponting and Clarke. For non-Australians, I like Kohli. Talk to us a little bit about your association with the ACF and US cricket. I just wanted to get a perspective on what your role is? I don’t want to go a lot into this, last summer, I spent some time with the USA team. They played Bermuda. All I can say is that, I’m just disappointed in the way that things have gone about. I’m disappointed because I think that they have a great deal of potential and I don’t know the political issues. All I know is this that they are continually shooting themselves in the foot and it’s a shame that the United States with all of the resources and sports market can’t get off base one. There is no other reason than some type of issue off the field. I don’t know what it is because it’s just a shame. That’s all I can say. There’s a lot I could say, but I can tell you this. They aren’t even close to reaching their potential. They just continue to shoot themselves in the foot. As a fielding coach, what is the one thing that you want changed in cricket that would give the fielder some perspective and an edge. Say for instance something like Double Play in baseball. There are a few, but one real simple thing is when a when a guy throws a ball at the stumps and if you hit the stumps, he’s done his job and ball ricochets, I think the ball should be dead. I think the play should stop right there. The other one is, a guy runs across the field, dives for the ball, stops it, doesn’t run outside the rope, his pant leg touches the rope. It’s a four. Are you kidding me? We have guys trying to dive for balls and dive inappropriately because they know they can’t touch the rope. We have injuries occur. Let’s remember before they put the rope in, which was a great decision, because it saves injuries, there was no boundary. The rule should be simple. The ball touches the rope, it’s four. If it goes over the rope on the fly, it’s six. Simple. The ball doesn’t touch the rope and the guy didn’t leave the field. He didn’t leave the field to come back in. As long as he touches the ball, he keeps it from going over, that’s fine. We allow guys to catch the ball going outside, jump outside the rope throw the ball back in play and fall over and catch it inside and the batsman is out. I think it’s a great play and it’s exciting, but how can you allow that and not allow this. It’s silly. Keep it simple. Sometimes, they complicate this stuff too much in cricket. I enjoyed this interview, thanks.